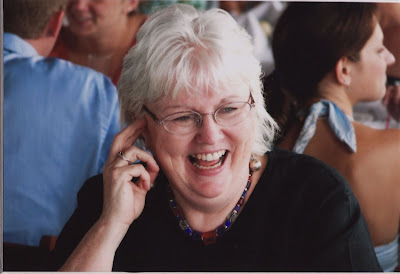 A personal note: My mother, Trish Feld, died yesterday. A few people who read this blog know that she's been seriously ill. The rest of you may have been wondering why I've spent the last couple of years going back and forth between Vermont, where I'm from, and my home in Lancashire. She is why. In August 2005 she was diagnosed with an aggressive and inoperable brain tumor. Mom weathered a grueling succession of radiation and chemotherapy treatments but gradually declined, and died quietly here at home yesterday evening, with her family around her. She never lost her sense of humor, and faced her ordeal with tremendous courage and grace. Here's a little piece a local newspaper columnist wrote about her life. A children's librarian, she cared passionately about reading and learning, and she touched the lives of so many people, both personally and professionally, that we aren't sure the church is going to be able to hold everyone. Nobody knows why people develop brain tumors. If, through the wonders of Google, anyone happens on this post in who is in the same situation, I will pass on the valuable Brain Hospice site, and this book that straightforwardly describes what happens after diagnosis from a first-person perspective. If I have learned anything from this experience, it is just the same things people always learn, over and over, when someone dear to them dies. But they still bear repeating: your family are always more important than anything else. Tell them how much you love them, early and often. And appreciate them while you have them; you never know what life is going to throw at you. Hi Kate, having read the column about your mum it is clear she brought a lot of fun, warmth and knowledge to many people and that can never be taken away from them. She brought love and laughter to everyone whose life she touched. Our lives, like the lives of many others, will be emptier without her. But we are blessed to have known her, and blessed by the children she brought into this world. Oh Kate, I am so sorry. My thoughts are with you. My name is Nancy and I am a librarian because of your mother. She was a passionate, and creative woman who represented the very best in this world. She had integrity and grit. I loved working with her and knowing "a real pro" was just down the street when things got sticky for me. When I was in library school I had an assignment to interview a librarian-- your mother came highly recommended. We were, in this particular class, supposed to prepare a Policies and Procedures Manual. When I asked to see your mom's she brought out a book affectionately called "How I Run my Library Good". I was hooked. As far as I was concerned, she was forever Library Goddess in my eyes. I will never forget the love and support she offered to me as a colleague, and as a friend. I'm so sorry to hear the news. I hope you are all managing as best you can in the circumstances. You describe your ma beautifully, and I recognize a lot of her in you. Thanks to all of you for your good wishes. Condolences Kate. A friend of mine died unexpectedly in the same way last year. Everything you say about the lessons we learn is true. Manchester will be waiting for you when you get back. Sorry to hear your news Kate. All the best. Kate, I'm so sorry about your loss. It sounds like she was an amazing person. So sorry to hear of your loss, Kate. I'll be thinking about you. I fell into your blog from elsewhere as I liked your (its) name and I also live in the NW. Thankyou for this wise posting.Your attitude is strong and wonderful and absolutely right. I still miss my folks several years on, but believe me, they stay with you. They still turn up with their helpful thoughts, their caring advice JUST when you need it.And they'll still love you through thick and thin. It's so true too about putting family as a priority. And talk with them, laugh with them....know them as your friends too. I'm very sorry to hear that, Kate. Thinking of you at this difficult time. Hi Kate, I second flat out's statement. Hang in there girl. Much love and warm thoughts from Manchester. I'm sorry to hear of your loss. Best wishes to your family. As a relative newcomer to your blog, I didn't realise your Mum was ill. So sorry about your news. At least she was wih her family. Take care. Sincere condolences at your loss. Very sad to hear your news. I don’t know if you remember me but I met you at an “end of the year” party your Mom had at her home for her Crossett Brook co-workers about six years ago. I worked in the same general space with your Mom at CBMS, as their Learning Center Coordinator and the classroom used to be to the side of the library. Your mom was a helpful, kind and generous lady (with her comments, energy, ideas and advice). She provided me with guidance around my personal professional development with hints and suggestions, helping me to make clearer boundaries or changes to things that would make for better results. She politely picked up on my spelling errors, increasing my attention to detail, provided support to my many questions and helped to contain my sometimes overzealous, energy! The photograph that you posted is a smile that I will always see when I think of Trish. I am thankful for getting to briefly know her and I am so very sorry for you loss. So sorry to read this news - my thoughts are with you. I am generally a non-believer, but I do think that people who loved us never leave us forever. My heart goes out to you in this time of your life. I was visiting the Crossett Brook website and saw that the library was now the Trish Feld Library. I immediately had this sinking feeling in my stomach thinking that it was odd they would name it after your mom if she was still there. I did an Internet search on Goodle and came across your blog. I was heartbroken to see your post about your mother's passing. I last saw your mom in 2003 when I was a long-term sub for the current librarian, Jen Miller. Although your mother was only in my life a short time, she made a tremendous impact on my life and continues to make an impact on my students, through me. Your mother was one of the most amazing women I have ever met. Since my time at Crossett Brook I have been a reading specialist and am now back in the classroom. I will always keep with me the ways in which she was able to get students excited about reading. I used to love to sit through her booktalks and have told many other librarians about her enthusiastic ways. I strive daily to get my students as excited about reading as she did. I am so sorry to hear about her passing.